FLAC at what bit-rate? I play FLAC at 24/192 and higher. 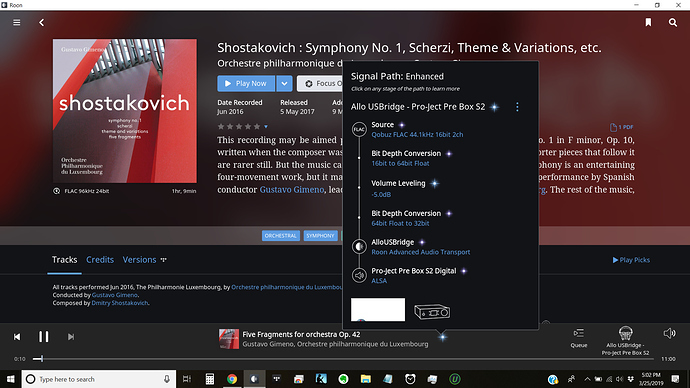 Can you post the signal path pop-up list while the relevant tracks are playing? FLAC is lossless compressed packaged PCM. Can you please share an example album with screenshots including signal path. I should have said. On Roon, Miss Universe, by Nilufer Yanya, the album source details are indicated as “Qobuz FLAC 44.1kHz 16bit 2ch”, whereas on Qobuz itself the same album’s source information is “24bits 44.1kHz”. In fact, none of the albums listed in Qobuz with the “Hi Res” have that Qobuz source label / indication once in Roon. When you play them in the Qobuz app does they actually play at high Res. Qobuz has made quite a few mistakes with labelling files correctly this will help narrow that down. I have already reported the issue of Qobuz tracks marked as hi-res playing as redbook in Roon. If I get a chance, I will see if they play back in hi-res from the Qobuz app. As a follow-up this album, marked as hi-res, plays back as redbook both in Roon and the Qobuz app. We’ve seen this before. It may be one of those items that is available for purchase at 24/96 but only streams at CD rates. They need to make such distinctions explicit. Can you share a screenshot of what you’re seeing here? I just looked into this album and it appears that things are showing correctly here. As mentioned above, there are some instances where the file qualities shown in Roon from Qobuz is incorrect as that quality is not available to stream. We are currently working with Qobuz on a solution to this. I see exactly what @Gerald_Richardson showed in his first figure and it is not uncommon. 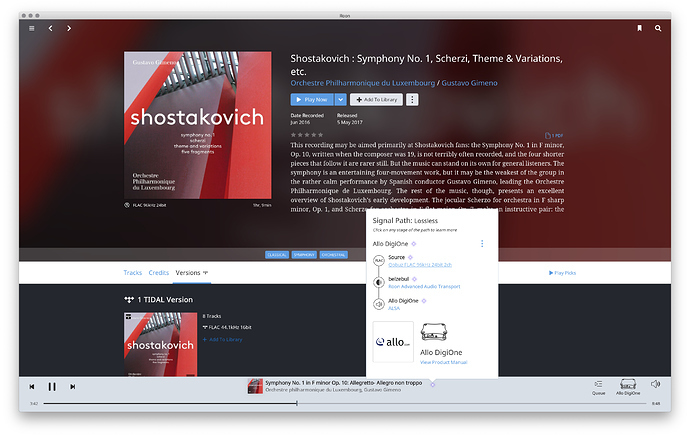 All of the Pittsburgh Symphony high-res series only plays back at CD quality. Grateful Dead @ Cornell 5.8.77 is also listed as 192/24, yet it only plays back at 96/24. I love the general Qobuz experience, but the sheer volume of these instances is pretty disturbing. Maybe - that’s not one of the albums I tested. 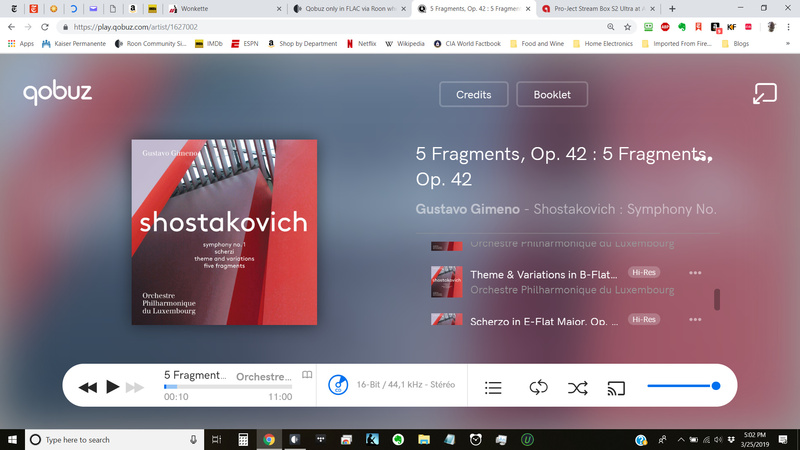 Just checked the Shostakovich you posted, and it does indeed play at the advertised 96/24 rate here in the U.S. I just checked, too, and it now plays at 96/24 although it did not last night. I think this might be a moving target as Qobuz seems to be constantly updating their stuff. The album does indeed play at 24/96 today where it did not yesterday (3/25/2019). Several other Qobuz albums I imported that same day (3/9/2019) also now play correctly where they did not before. Well, I emailed Qobuz support this morning with links to the albums I mentioned above (PSO and the Dead at Cornell). Now I’m home that same evening and they are playing correctly! This gives me encouragement to keep emailing support as I come across these issues (I suppose that’s what a beta program is for). I’m glad they fixed those titles.